Burned trees and scorched earth can be seen in the forest where the 416 fire burned on June 13, 2018 near Hermosa, Colorado. 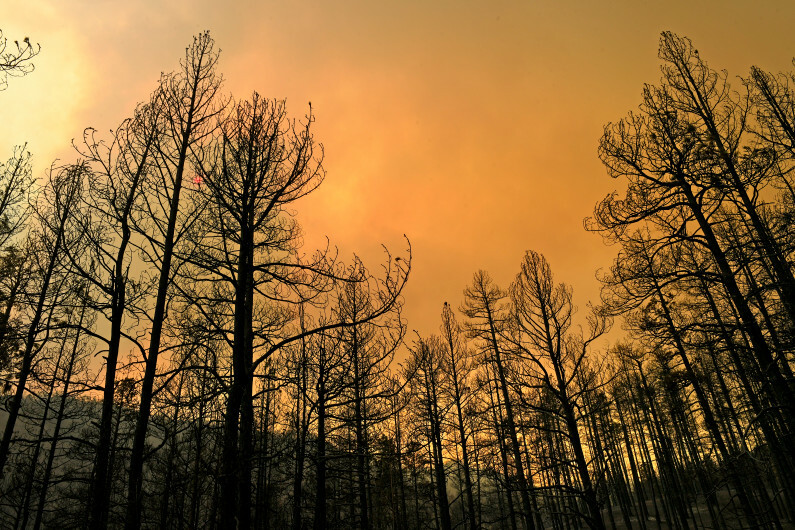 The fire, burning 23 miles northwest of Durango, started June 1 and has now burned 26,500 acres. The fire is 15% contained. No homes have burned and no firefighters have been injured. As at least a dozen wildfires scorched Colorado’s forests Saturday — forcing evacuations, consuming homes and closing roads — a 52-year-old man was arrested on arson charges in connection with one of the worst blazes. The Spring Creek fire, burning east of Fort Garland in Costilla and Huerfano counties, has grown by more than 8,000 acres, reaching 41,292 acres as of Saturday evening, according to the Rocky Mountain Incident Management Team. The wildfire has destroyed an undetermined number of homes. Jesper Joergensen was arrested on arson charges, officials confirmed at a 1 p.m. community meeting. The ongoing fire investigation is led by the Costilla County Sheriff’s Office, which is receiving help from the Colorado Bureau of Investigations, state arson investigators, Colorado State Patrol, and agents from Immigration and Customs Enforcement. A Costilla County detention officer told Reuters News Service that Joergensen, who is not a U.S. citizen, was to be handed over to ICE. The officer could not immediately state Jorgensen’s nationality.